Give your A4 a sportier look with this trunk lid spoiler from the S-Line Competition setup. Spoiler arrives primed and ready to paint. 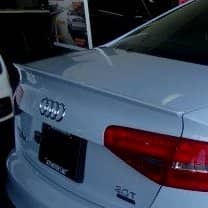 *Note this spoiler is only for A4 non S-Line models and will not fit A4 S-Line or S4 models with the integrated trunk spoiler.